How to find out how many zones the control panel is supporting? The maximum number of zones in the alarm system is described in the last two digits of the control panel model. For example control panel PAS832 supports 32 zones . 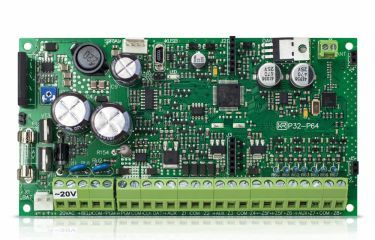 Can the system be directly connected to the 230V AC? No! The system must be connected to the 230V AC network via voltage lowering transformer with ~230V AC, 50 Hz primary winding and secondary winding of ~20V AC 50 Hz. Secondary winding must ensure 1,5 A working current. What to do if one of the users forgot the PIN code? A user who know his PIN code can help by going to [Settings] →[Users] →[Edit Users] →[Restore default Pin] in the LCD keypad menu. Then the user must create a new PIN to replace the forgotten one. How many LCD keypads can be connected in one alarm system? The keypad is a system module. Up to 7 modules can be connected to PAS808, PAS808M and up to 15 modules can be connected to PAS816, PAS832, P32 and P64. Can the LCD keypad be installed outside? No. The temperature range that the LCD keypad is able to perform is -10oC to 50o C. The keypad's construction does not protect the electronic components inside from water or condensed moisture due sudden temperature changes. Can the system be controlled by phone? Yes. The system must have GSV6 or GSVP module with a valid SIM card. Alarm system with this type of configuration can be controlled via calls, SMS messages and Android® or iOS® smart phone applications. Can two GSV6 modules be regsitered in the same system? No. The system equalizes the module settings and both modules will be working parallelly. For example, it will be sending the same SMS message to the same phone numbers. GSV6 is not working even though SIM card is inside. Check if there is sufficient credit in the SIM card balance and if the PIN code request is switched off. If GSV6 is successfully sending out SMS messaged but fails to call, make sure to check the SIM card plan and see if it allows calling. Battery changed it's primary shape and now looks `swollen`. What to do? Immediatelly change the battery. Faulty batteries frequently have lead precipitation, which make up a conductive layer, making the battery use overcurrent while charging, which causes heating and shape changing. Sometimes faulty batteries de-encapsulate and have acid leakages. 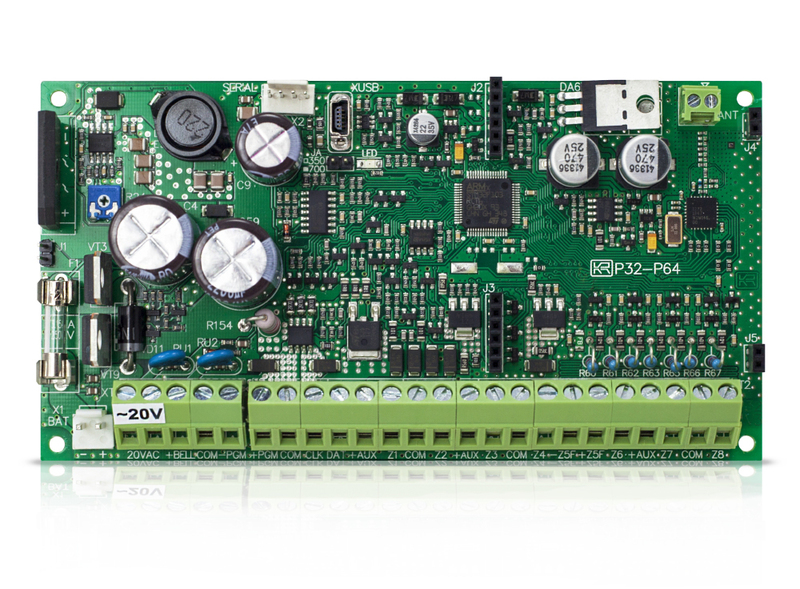 Control panels PAS816, PAS832, GSV4, PS32 and P64 have overcurrent detection unit which disconnects the faulty battery. Can I change the system settings remotely? Yes. The server www.alarmserver.net is used for this purpose. The alarm system can send it's settings (project) to the server. The person in charge of system management (installer) downloads the settings into his computer, changes them using MASCAD and sends them back to the server. Later, the user commands the system via LCD keypad to obtain the settings file from the server and install it. Why does the system not recognize newly connected module? What to do if the system cannot recognise additional keypad? For security reasons, an activate alarm system does not allow to freely connect extra LCD keypads. Using a keypad that is already registered (the one that is already working in the system) enter service mode. Then go to the new keypad and you will see `No control. Address 00` on the screen. By pressing keys 1 to 5 set the new address of the keypad in the system. Return to the keypad that you used to access service mode and perform automatic module registration procedure. Afterwards, the system will suggest to send project to all registered system modules. Press enter in order for the system to send the project to all system modules and to finish the keypad registration procedure. Can a computer be connected to an active system? If the computer is used for changing settings - the system has to be connected to the power supply. If the computer is used for updating module firmware, the system has to be disconnected from the power supply. How to find out module's address in the system? I changed the keypad language to Russian but when entering names I cannot see Russian symbols. What do I do? Changing user interface language does not change text entering language. In order to change it you have to go to [Settings] →[Keypad Settings] →[User Interface] →[Alphabet Option] and choose Cyrillic. Can I connect/disconnect modules when the system is connected to the power supply? The smoke detector is being trigerred even though there is no smoke in the room? What do I do? Most smoke detectors have a pair of photo and light emitting diodes. If one of these elements is dusty, the detector may perceive it as smoke. It is recmmended to disconnect all detectors from the system, remove plastic cover and clean all diodes and the camera in which the diodes are installed. Cleaning the detectors with a stream of air or with a vacuum cleaner is not effective. It is recomended to not put smoke detectors near vent-holes. Why I cannot disarm alarm system according to timer? Because it is against EU standard EN 50131-1:2007/IS2:2010. If you have more questions - contact us.